Dominated by her husband, her family and society, Belmaya is desperate for independence. But she is a daughter of Nepal, where men make the decisions and women keep their mouths shut. Here, in one of the poorest nations on earth, women are daughters, wives, mothers, dependents, victims, slaves. Rarely individuals in their own right. Born a Dalit (the lowest, ‘untouchable’ caste), orphaned at the age of nine, and trapped in an abusive marriage with a baby daughter, Belmaya, by the age of 21, has given up hope of finding happiness. Rewind to 2006, when Belmaya, at 14, participated in the My World, My View photo project in Pokhara. Impassioned and inspired, she had dreams of becoming a photographer. But that window closed when the home she lived in locked away her camera. As the film opens, in 2014, Belmaya is about to embark on a transformational journey to reclaim her voice, as she trains in documentary filmmaking. Through studying documentaries and exploring her own and other women’s stories through the video camera, her consciousness and confidence expand. Realising she can make choices, she finds the courage to stand up to her abusive husband and the power starts shifting into her hands. 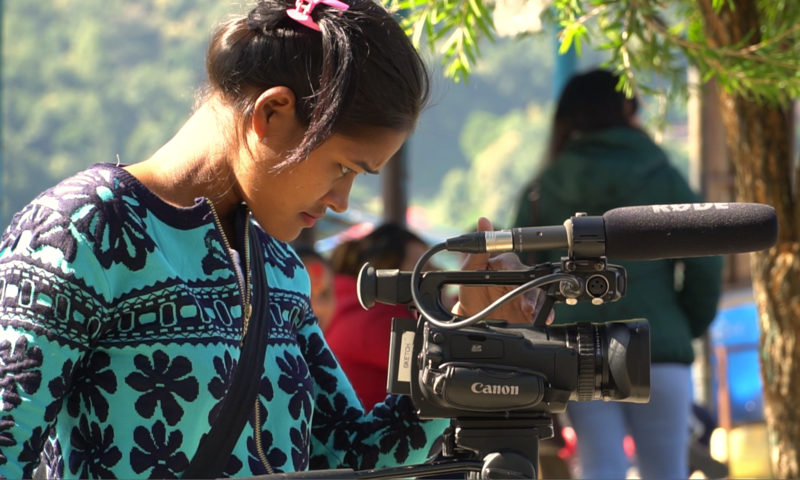 In 2015, she gets work filming the Gurkha 200th anniversary celebrations, and in 2016 completes her graduation film, Educate Our Daughters, about the importance of education for girls, which is currently being submitted to film festivals. This is followed by her first professional commission, by Thomson Reuters Foundation, Rowing Against the Tide, about boatwomen struggling to compete in a man’s world. The ripples of Belmaya’s personal journey touch those around her, at first causing friction and opposition, but ultimately transforming her husband’s behaviour, her family’s attitude towards her, and the outlook for her 5-year-old daughter. I Am Belmaya is an extraordinarily intimate window into Belmaya’s world, giving an insight into the brutality of life for many girls in Nepal, and showing her determination to challenge social norms and transcend the life she was born into. The result is a rich portrait, interweaving observational footage with footage shot by Belmaya, as she becomes author of her story and takes charge of her life.